Could the TC Helicon Mic Mechanic replace all your live voice processing? Do me a favor to start off by closing your eyes and picturing two things: Swiss army knives and sport utility vehicles. Now ask yourself what comes to mind? General all-purpose-ness? Usable but not ideal? If you miss what I'm driving at it's that generally things perform better when they are built for a specific task. TC Helicon, on the other hand, may just have figured out how to buck that trend. I generally try to refrain from waxing ecstatic by maintaining my most professional unbiased opinion when it comes to product reviews here at TMV HQ but TC Helicon's latest offering is making me a bit giddy. Why you ask? Well, it's simple really. I introduce to you the Mic Mechanic: an all-purpose live vocal processor that sounds so good out of the box it nearly made me do a double-take the first time I rigged it into my signal chain. We've been collectively impressed with the concept TC has created with the VoiceTone pedal series with an effort towards studio quality vocal processing with simple analog-style user interfaces. Rotary knobs and stomp switches replace LCD menus and rows of buttons all the while maintaining pretty sophisticated digital design under the hood. With each generation of new products Helicon has continued to revolutionize what makes for cutting edge vocal processing and they that concept even one step further with the Mic Mechanic. TC Helicon touts the Mechanic as a complete vocal toolbox and they may not be far off the mark. 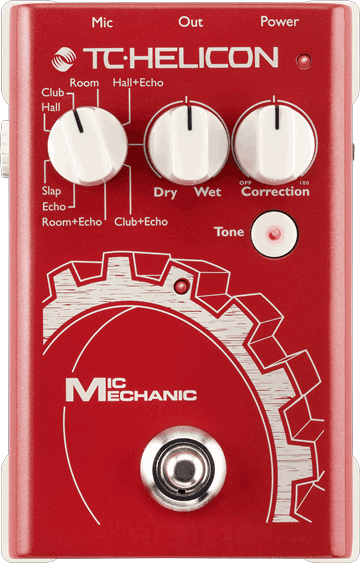 Considering its diminutive stomp pedal form factor the Mic Mechanic comes equipped with 3 reverbs, 2 echos as well as combinations of each, automatic chromatic pitch correction, as well as adaptive tone with EQ, compression, de-essing and gating. That doesn't even take into account the built in mic-pre with phantom power and remote effect control via the MP-75 microphone. Obviously at this point you now have a small stomp pedal that is trying to do the job 3 or 4 TC pedals did so on the surface it appears there are compromises. Tone control is either on or off, pitch correction has a single knob of control and the effects only have a dry/wetness knob and yes changes in effects mid-performance require you to reach down and manually change them. TC has however cleverly integrated a tap tempo into the effects bypass switch if you first hold it down until the effect on light flashes. In the end I found the compromises to be nearly meaningless as the Mic Mechanic sounded so good out of the box I could have cared less about it's supposed limitations. With adaptive tone my voice cut over the band better than it ever had, big lush effects were dialed that sounded great in seconds and pitch correction was the most natural I have ever heard out of a live rig. All these things acted in unison to really make my vocals 'pop'. For $149.00 the TC Helicon Mic Mechanic is in my opinion one of the best sounding new vocal processors on the market that easily sounds as good as voice processors costing 3-4 times as much. It wraps studio quality effects into a simple compact package that sounds literally fantastic right out of the box. We at TMV give the Mic Mechanic our highest level of recommendation.